Sometimes I run across a therapy material that is so awesome that I just have to share! Last month, a kind parent gave me an Amazon gift card to use towards therapy materials and one of the things I bought was "Bunny Peek-a-Boo" by SmartGames. It had been on my Therapy wishlist forever, but I hesitated to buy it because of the steep price (close to $30). Now that I own the game I am so glad I do! 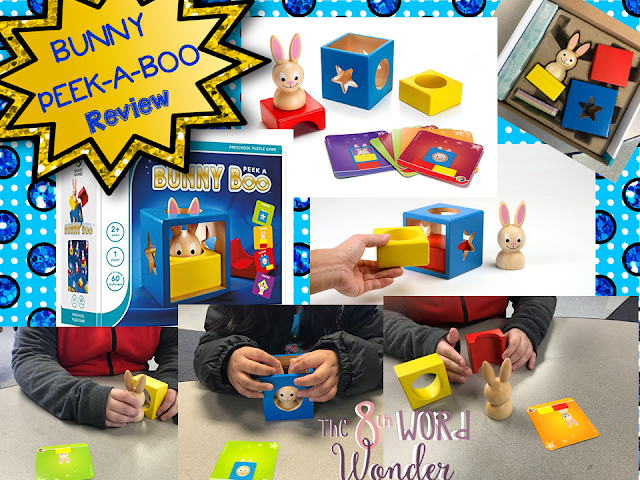 Bunny Peek-a-Boo consists of three wooden blocks, a wooden bunny figure, and picture cards. The premise is simple: students have to arrange the blocks and bunny figure in such a way that it matches the picture on the card. There are 60 different challenges at four different difficulty levels (15 challenges for each level). I used this during my therapy sessions with students ranging from Kindergarten through 5th grade (the 5th graders were students from our self-contained Special Day Class) - everyone thoroughly enjoyed it! Even though this toy is recommended for ages 2+, some of my older SDC students already began to struggle at Level 2, which was great in terms of learning opportunities. This game is excellent for speech & language therapy, as it promotes problem-solving, flexible thinking, and can be used to work on positional concepts (e.g., "Where is the bunny?" - "The bunny is on top of the blue block"). I absolutely LOVE this product and given it's sturdy quality I know we'll be using it for years to come! I can't recommend it enough!